Remember the 1998 U.S. vice presidential debate when Sen. Lloyd Bentsen told Sen Dan Quayle: "I knew Jack Kennedy, and you're no Jack Kennedy!" Well, in the insect world, there's a fly that looks a lot like a honey bee, but it's no honey bee. It's a drone fly (Eristallis tenax) from the family Syrphidae. It resembles a drone (male) honey bee. 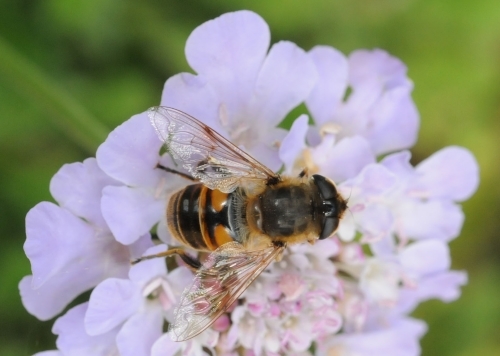 UC Davis entomologist and emeritus professor Robbin Thorp of the Harry H. Laidlaw Jr. Honey Bee Research Facility, who does research on native pollinators, identified the drone fly below as a female. 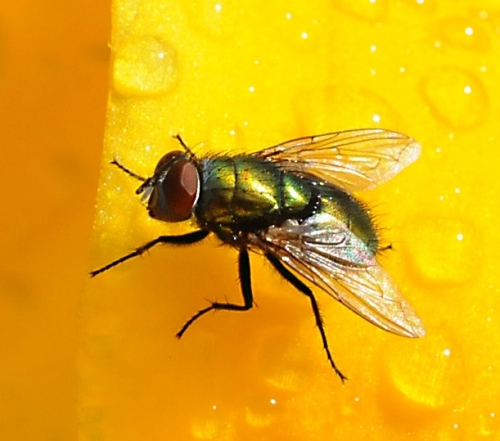 The drone fly is brownish black with light yellow triangles at the base of the abdomen. "It's sometimes called the 'H fly' for the pattern on the front of the abdomen," Thorp said. 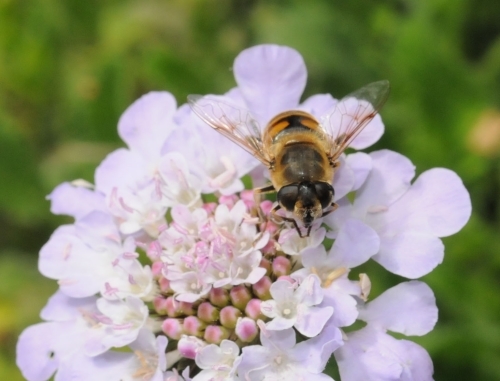 So, what's the resemblance between a drone fly and a drone honey bees? The eyes. And the similar bullet-shaped bodies. 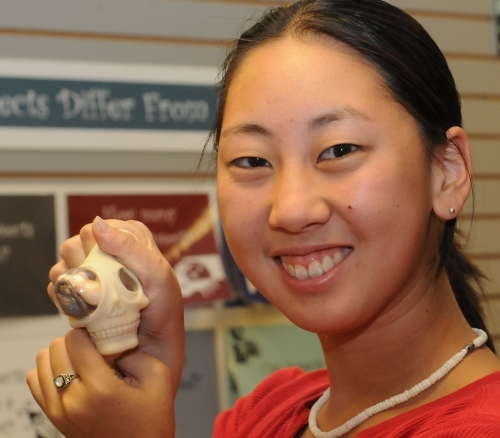 "The eyes look quite a bit alike," agreed UC Davis apiculturist Eric Mussen. However, the honey bee has four wings, and the drone fly, two. "But sometimes," Mussen said, "you don't notice the drone honey bee's other pair of wings." 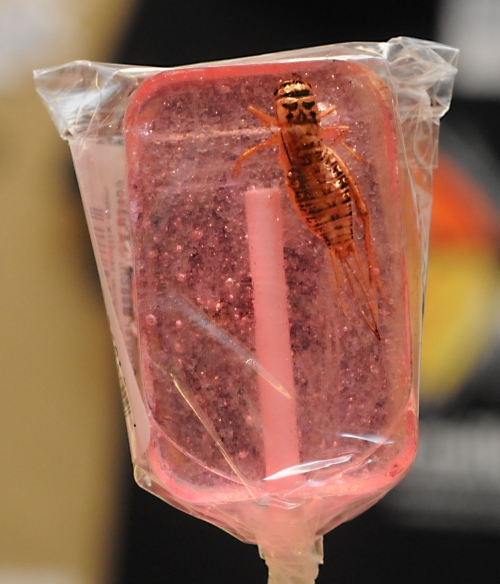 There's no mistaking the larvae, though. They drone fly larvae are aquatic. They live in drainage ditches, sewage, and stagnant ponds or sluggish streams. Each little sausage-shaped larva has a long breathing tube which it extends to the surface for oxygen. It's known as a "rat-tailed maggot." Did anybody say "Yecch?" Yecch! Sometimes you'll see the rat-tailed maggots moving around in fresh cattle dung or, shall we say, moist excrement. When it's an adult, it visits flowers, like this drone fly did in the Storer Gardens during the recent UC Davis Arboretum Plant Faire. I'm glad it wasn't a rat-tailed maggot. Well, it's not really a Halloween butterfly, but it is orange. The Fiery Skipper (Hylephila phyleus) visits us more than the politicians do at Election Time. 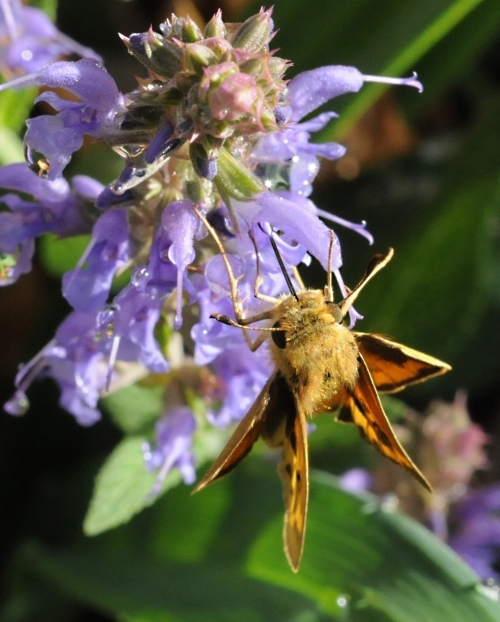 Last Sunday we spotted four Skippers in our backyard. Only two politicians skipped to our front door. The Fierry Skipper nectars our sage, adding a decidedly orange glow to the purple flowers. UC Davis butterfly expert Arthur Shapiro says this one (below) is a male. It's California's "most urban" butterfly, he says, adding that it's almost limited to places where people mow lawns. Its range extends to Argentina and Chile. 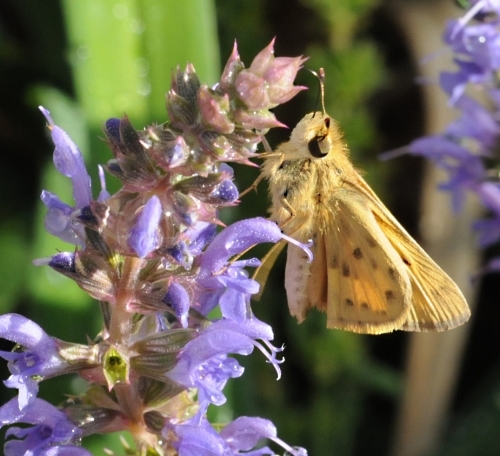 The oldest Bay Area record of the Fiery Skipper dates back to 1937. Its caterpillar hosts include Bermuda grass, crabgrass, St. Augustine grass and other grasses. Well, that counts us out. We have none of those, just a bee friendly garden. No lawn. No grass. No weeds. Just a big burst of flowers. So said actor Clint Eastwood, as the character Harry Callahan, in the 1983 movie, Sudden Impact, after a robber grabbed a hostage. "Dirty Harry" was known for blowing away the bad guys. Clashes and confrontations often ended with blow flies on bad guys. 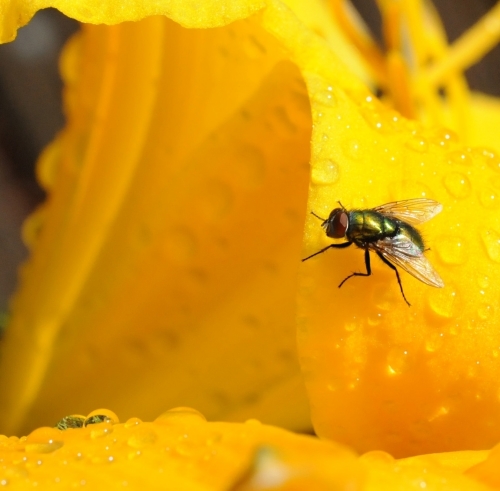 Recently a green bottle fly that touched down on our daylily "made my day." The rich golden blossom and the red-eyed insect with its emerald-green metallic body seemed to go together nicely. I know. I know. A green bottle fly (Phaenicia sericata) isn't exactly the poster child of the insect world, but it is pretty. Pretty on a golden daylily after an autumn rain. Plumbers, especially a plumber named "Joe," are hogging the news a lot lately. But what about the carpenters? What about the carpenter bees? The carpenter bee, a black bee larger than a bumble bee, burrows into dead trees, logs and your unpainted or unvarnished fence posts or deck. You’ll see it nectaring flowers, too. 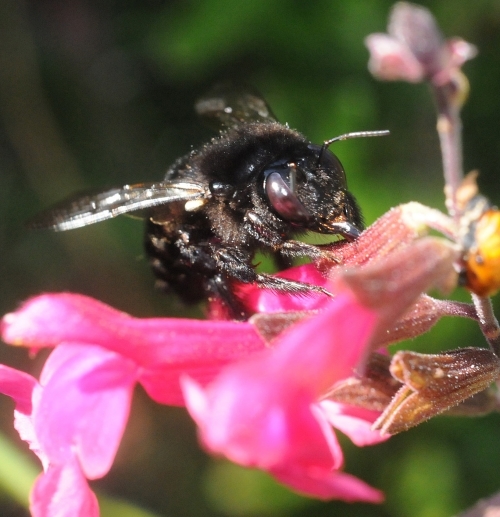 Below, this female carpenter bee (Xylocopa) is robbing nectar from sage. Maybe she's Josie the Carpenter? You’ll hear the carpenter bee before you see it. Its buzz is loud and it means business. 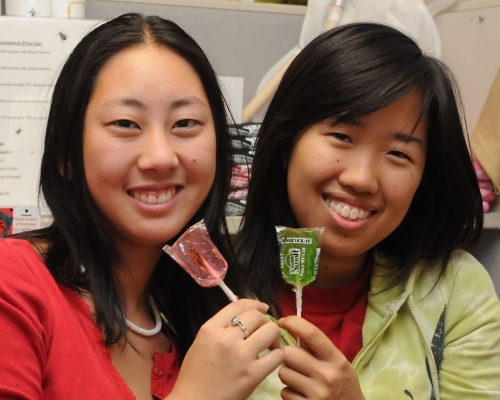 The next thing you notice: the eyes. They're huge. Carpenter bees, like most adult insects, have compound eyes. The surface contains circular or hexagonal areas called facets. Each facet is the lens of a single eye unit or ommatidium. The lenses of the ommatidia form images. Insects with compound eyes readily detect motion and sense ultraviolet light better than we humans do. The better to see you, m' dear.